Parkstone Yacht Club Ladies Day – Organised and run by the Magenta Project. Watch out traditional ladies days, the high heels and questionable dress codes of Ascot, Cheltenham and Goodwood, and all of the Yacht Club coffee and tea sessions called ‘ladies days’; the Magenta project has rewritten the rules. Annie Lush and her team at the Magenta project are using their experiences on the Olympic circuit, Volvo Ocean Race, M32 World Match race series and GC32 Extreme Series to prove that ladies are not just supporting men sailing, but doing it themselves, so no excuses for the Parkstone Yacht Club ‘ladies’. 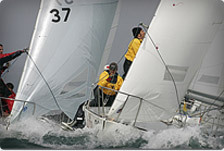 For many years the Club, under the cheerful guidance and enthusiasm of member Nigel Pearce, has had a large group of Ladies racing and training in a variety of single handed boats, from Pico’s to Lasers. Annie, a Parkstone member, organised a highly acclaimed and enjoyable day introducing 31 women and 8 youth sailors to keel boat sailing. 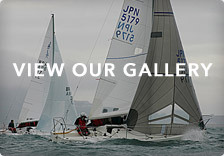 The local J 24 fleet kindly lent eight boats with their owners, and Kate Macgregor (London 2012 Olympian and Team Magenta match racer ) and Abby Ehler (twice a Volvo Ocean Race sailor and Magenta project director) joined Annie as on the water coaches. The day started with a dockside introduction to the J24, and as the new teams motored out in bright sun and zero wind, the Magenta Magic started, with a warm southerly gently increasing through the day, learning to tack and gybe, encouraged by coaches and owners was quickly followed by follow my leader, various drills, with the crews rotating positions, and ended with a pre lunch race. 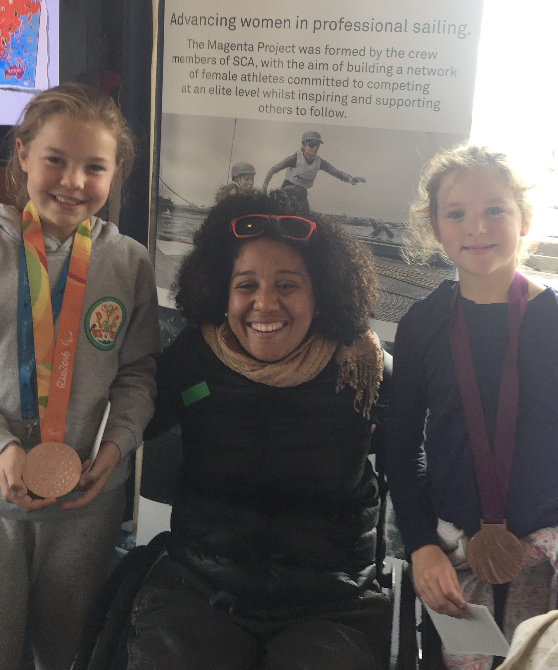 The Club hosted a lunch whilst the Magenta girls entertained the children, relieving the fathers of baby sitting duties for a while, with tales of racing and sailing, The girls were joined by two times Paralympic medalist Alex Rickman. Top job was being medal monitor as Alex kindly let the children hold her medals, guaranteeing some disbelief in various Poole schools show and tell sessions today! Lunch was followed by Saturday J racing, and the new crews volunteered to join the owners and some of their team for the race, the wind increased to a strong breeze as the rain lurked over the Purbeck hills, but the race officer shortened the course just in time, so the J’s were safely back in the marina before the skies opened, and the happy teams returned to the Club house for a Magenta tea party and prizegiving. Thanks to the owners, the Clubs super supportive Commodore, Bryan Drake, Roam photography, and Spinnaker Watches, Musto and Team SCA for great prizes. 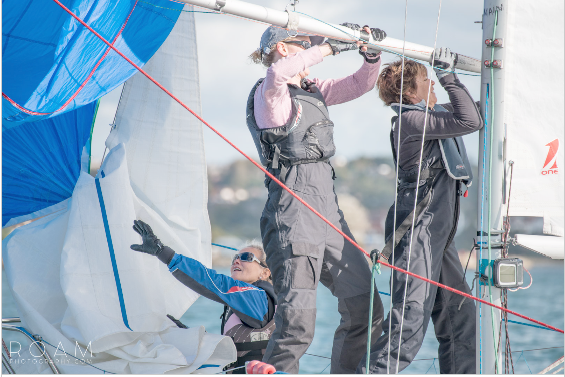 Top outcomes, a women’s team has already formed to J race next year on J 24 ‘Zaphod’, and another team is keen to use one of Parkstone’s three Club owned J 24’s for evening racing. 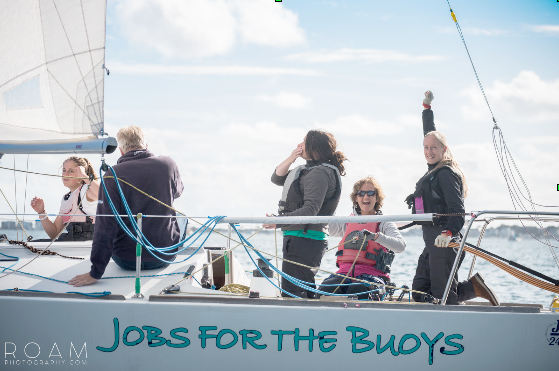 And yes, women can sail, really sail, the J 24 Class has a great resource of good new crew, and everyone enjoyed the teamwork and new skills, no shouting, no tears, just huge smiles. Well done Magenta, the bad news is you have to come back and make this an annual event. Time to change that boat name chaps! Written by an anonymous J 24 owner, off to change his boat name.